Duncan & Taylor is an independent bottler of Scotch whisky, and it has produced some some pretty spectacular drams – the Black Bull 40 Year Old and Glenrothes Octave 40 Year Old sit at the very top of my list. The “Lonach” series from Duncan & Taylor celebrates the annual Highland gathering, the “Lonach”, which is aimed at preserving Scots culture and the Gaelic language. Reflecting this mission of the “Lonach”, Duncan & Taylor have bottled from very old whiskies in this range at very accessible prices and this obviously gives most people the opportunity to experience a special drink – a whisky that has taken over 40 years to produce, but not just any whisky, a Scotch. What is more Scottish than Scotch whisky? In fact, the word “Scotch” is simply an old fashioned word for Scottish, but now it has become synonymous with whisky from Scotland; Scotch! All Scotch is whisky but not all whisky is Scotch. 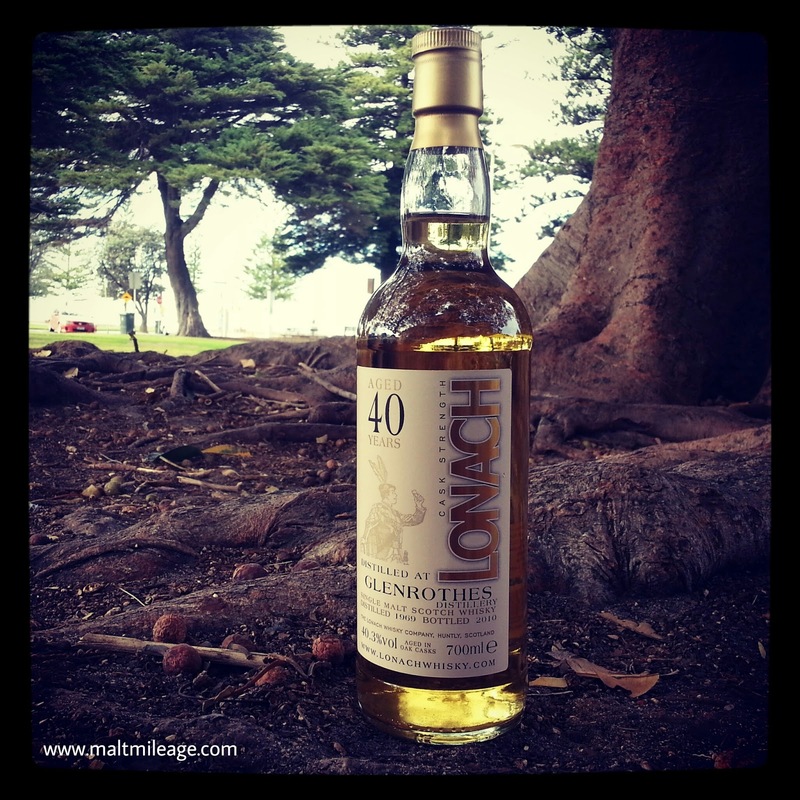 The Lonach range is a “vatting” of two casks from a Scottish distillery, and ‘occasionally’, Duncan & Taylor state, ‘over and under strength casks are vatted together.’ You may know that whisky must be at least 40% in alcohol volume to be legally called “whisky”. When spirit is first distilled its alcohol volume is usually much higher than 40%, but over many years maturing in an oak cask this alcohol volume reduces and over the course of 40 long years it may reduce to below 40%. What may be meant by a vatting of “over and under strength casks” is that, sometimes, it may be necessary to combine a cask with spirit that has reached below 40% ABV with one containing whisky above 40% ABV so that, when combined, the whisky is over 40% ABV and can be sold as “whisky”. Tasting notes for this whisky are short. The wood, spices of mild ginger, nutmeg and subtle peppercorns dominate over some waves of smoothing vanilla custard that sit beside honey glazed waffles dusted with nutmeg, cocoa and dollops of preserved apricot with shavings of citrus rind – the flavours are tainted with wet bark as the wood spices develop towards the finish. The finish vanishes quickly, with the wood lingering. This is an enjoyable whisky, and recommended for anyone who is itching to try a 40 year old single malt at a great price – it won’t blow your socks off but it will scratch your itch at least! This is a 40 year old single malt at exceptional value. It offers some of the hallmarks of age, and this is a perfect introductions to older styles of single malts. There is obviously much better similarly aged whisky on the market, but good luck getting it at anywhere near this price.